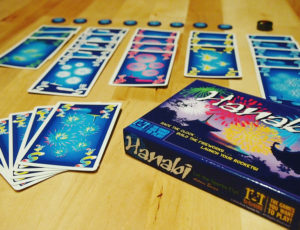 Vibrant fireworks ignite across the sky, while players strive to guess what cards are in their hands with the help of their friends – Welcome to Hanabi! Concepts: Hanabi consists of a deck of cards which are divided into five colours (red, yellow, white, blue and green), ranging from numbers 1 up to 5, with three 1s of each colour, two 2-4s of each colour, and only a single 5 of each colour. Also included are a handful of cardboard tokens. All cards are held with the back facing their respective player, and the face sides facing other players – each player is unaware of which colour and number is on their respective cards, and therefore need to cooperate with one another to play all five colours of cards in ascending order. 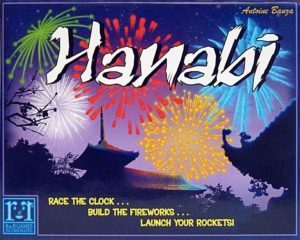 Writing: Hanabi sets the players as fireworks display operators, with the cards represent those fireworks – a nice and functional theme. The rules are laid out clearly and in a precise manner which allows the players to dive right into gameplay. Mechanics: On your turn, you have the choice of three actions – and only three actions, and you must take one of those actions. You can play a card from your hand, face-up on the table. You can discard a card – in doing so, you regain a time token. Or you can spend a time token in order to give another player a clue as to what cards they have in their hand. The time of clues that you can give other players are very strictly set. You can tell a player how many cards of either number or colour that they have – “you have two yellow cards” – and you can indicate which card you’re speaking about – “these two cards here, they are both number three”. The team start the game with eight of them -you regain one when a player has completed a set of any one colour – that is, playing the cards 1-5 of that colour on the table. The only other way to regain these tokens is to discard cards from your hand. Remember, of course, that you have only three options for actions, and two of them involve moving cards out of your hand. The safest option is usually to give a clue, but having only eight clue tokens to spend to do this, you will quickly find that you burn through clue tokens very fast. The only two other options are to play or discard a card – both of which are dangerous if you’re unsure what you might be holding and have neglected to keep track of the cards already discarded. Expect to feel as if you’re making a dangerous choice with every action! Design: Each card is of decent, although not especially sturdy, stock. The colours are vibrant and vivid, giving them a lovely aesthetic. The design with Hanabi is very tightly focused, making the game easily portable. 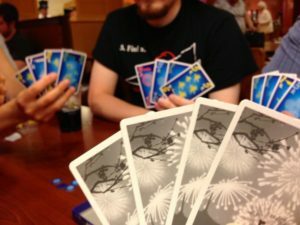 Playability: Hanabi is fiendishly difficult, but a lot of fun. Each time I’ve played it, I’ve found that we always end up stretching the rules to the very most – trying to read each other’s faces while we’re choosing which card to play, or over-emphasizing the clues that we are giving. If the players want an extra challenge, the game also comes with a ‘rainbow’ suit which can be added into the deck as an optional variant. Conclusion: We at the Cybe’s Website team found Hanabi to be an extremely difficult game. Each time we have played it, it has been very challenging – enjoyably so. Gameplay requires a considerable amount of thought and planning, and strong communication is key to success. The latter can make the game especially difficult when played with strangers, though, so we recommend this game primarily to existing gaming groups and close friends/families. FINAL THOUGHTS: An excellent, portable game which strives to deliver a lot with only a small number of cards, equal parts bluffing and guessing game that is fast to learn and takes a lot of skill to master.